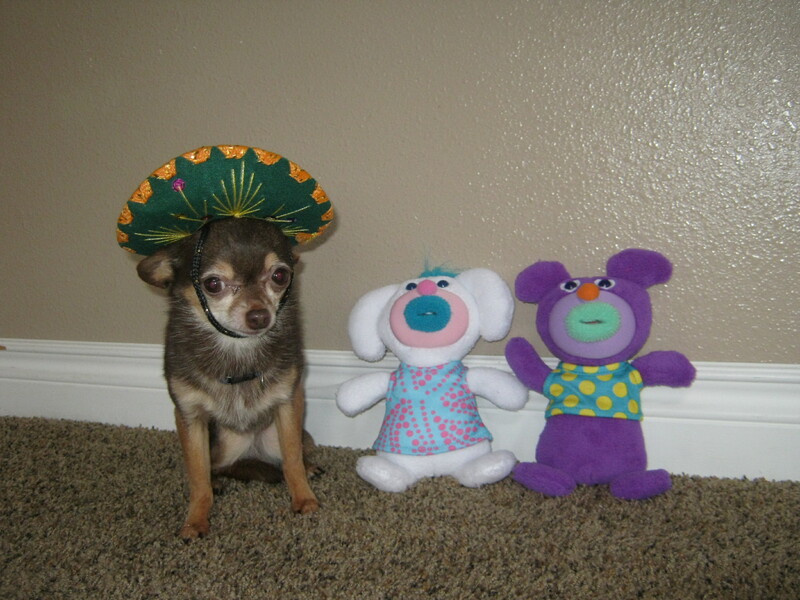 Hola amigos! Long time no see. Did you miss me? Sorry I went MIA for so long, but I was taking a much needed rest. The past couple months have been totally loco around here and I was beginning to feel the effects of too much action and not enough down time. Therefore I took the opportunity this past week to unplug from the both the computer and the kitchen and just chill. Mis padres went on vacation to Disney World (without me!!! how dare they!!!) and I got to stay with mis abuelos for the week (the other most magical place on Earth). Boy did those two spoil me rotten. So many cuddles and so much lap-time. And unlike mi mama and papa who are total dunces when it comes to cooking, both mi abuelo and abuela are fantastic cooks and don’t require my culinary genius-ness in the kitchen. Thus allowing me to just relax on my favorite blanket with a rawhide and a Greenie and wait for them to finish what they’re doing so I can make the rounds licking cleaning up their kitchen floor. Now pair that with the half dozen or so baby carrots I was able to lure from mi abuela on a daily basis, and I was definitely living the life. Not that I don’t totally deserve it. 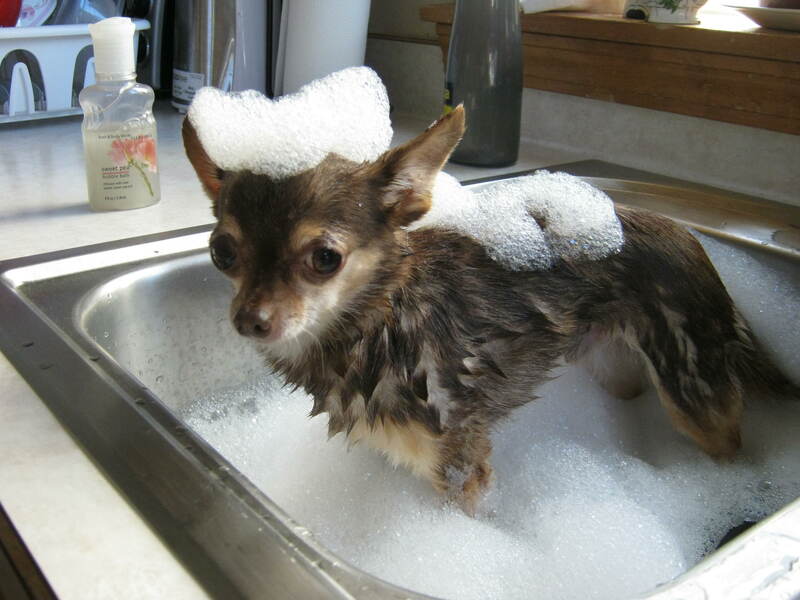 I don’t know of too many other 8 year-old Chihuahuas who do so much for so many other people. I’m such a giver. There really should be a museum named after me. Or at least a dog park. So now that mis padres are back in town and I’m back in my own house and my own kitchen, I’ve been cooking like crazy and doing what I can to get back into the groove. The break was nice, but I definitely love being back to my culinary ways. I can rest when I’m dead (which will be many many many years from now I promise, Mama). One of the first meals I made once I got home was this quick and easy one-pot dish that is a healthier spin on Hamburger Helper’s Chili Mac. 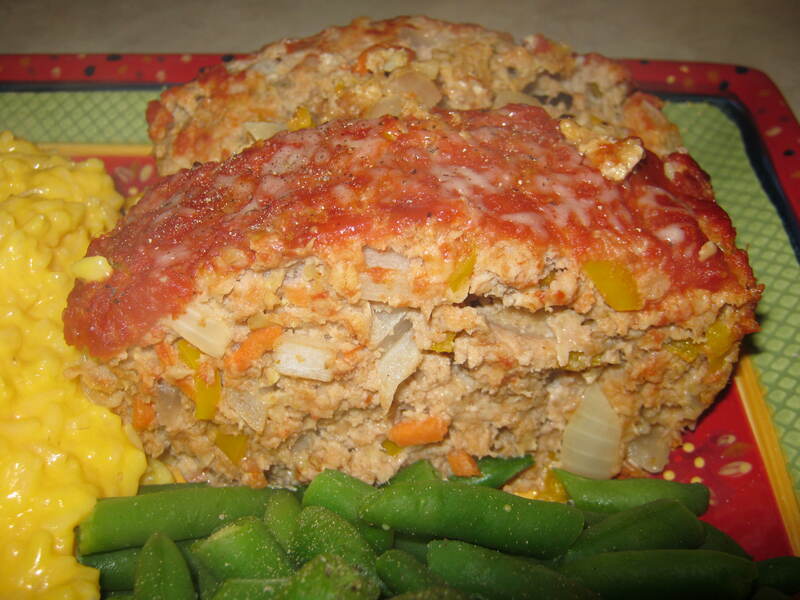 This version contains ground turkey breast and an abundance of vegetables and spices. So yummy, so delicious and on the table in less than 30 minutes. So there you have it compadres. Teeny’s back and better than ever. And a year older than when last I posted. 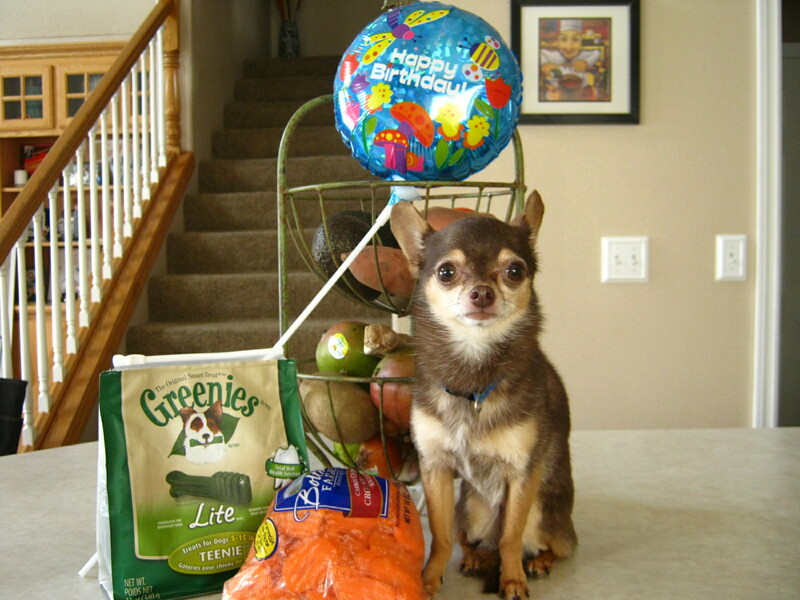 Oh yeah, did I forget to mention I celebrated my 8th birthday this past Sunday? Feliz Cumpleanos to me! And check out the great presents I received. What’s up with all the crazy fad diets out there? One minute carbs are good. The next they’re the devil. Fat is your friend. Fat is your arch-enemy. Protein is the key to losing weight, therefore adding even more protein is the key to losing the most weight. Gluten-free is the best road to optimum health. Don’t eat protein before noon, and then, only eat protein for the rest of the day. And of course one can’t forget the craziest of them all (and I apologize to anyone who has ever gone on this diet, but seriously, it’s whack), the Master Cleanse diet which consists of only consuming a liquid concoction containing water, lemon juice, maple syrup and cayenne pepper. Yeah, that seems totally logical. The “scientists” behind this one claim that it helps the body to cleanse itself from every day toxins that build up in the body’s system and that it’s the fastest, most effective and organic(?) method of losing toxic body fat in the form of excess weight. I’m not sure where that research was conducted (CrazyLand perhaps) but I definitely don’t buy into this diet one bit. Granted, one will lose weight going on the Master Cleanse, so that claim is actually true. But that’s only because a person is pretty much starving his/herself during that first week of the diet due to consuming fewer than 800 calories a day. One could eat 600 calories of Oreos a day for a week and lost weight as long as that’s all he/she is eating. Come on people! Whatever happened to just eating real food, moderate amounts of it, and not going on some crazy diet that’s guaranteed to be quick fix but obviously can’t be sustained over a long period of time? I may not have taken away everything I was taught during those 4 (or was it 6) years at the Universidad studying nutrition, but I did learn a thing or two about food and diet and overall health. And one of those is that there is no quick fix. There is no secret pill that will magically melt away fat. And that if it seems too good to be true, it more than likely is. 1) Pre-heat oven to 375 degrees. Spray a 9×13″ casserole dish with Pam and set aside. 2) Cook pasta according to package directions. Drain and combine with cottage cheese, Parmesan and egg. Mix well. Spread evenly in bottom of casserole dish and set aside. 3) Heat canola oil in a large deep pan over medium heat. Add turkey, garlic, onion and bell pepper. Cook until turkey is no longer pink and onion is softened, about 5-7 minutes. 4) Add tomato sauce, diced tomatoes, pumpkin, tomato paste, Italian seasoning, salt and pepper. Turn heat to medium-low and allow to simmer 15 minutes. 5) Pour tomato/turkey sauce over pasta and spread evenly. Bake 20-25 minutes or until bubbly. 6) Sprinkle shredded Mozzarella over top and allow to bake 5 minutes more. 7) Remove from oven and allow to sit 5 minutes before digging in. Holy yum-sauce! Serve with a nice salad and fresh loaf of bread and you got yourself a stellar dinner. Definitely not part of the Master Cleanse, totally not Atkins-approved, but undeniably healthy and full of real, non-laboratory manufactured ingredients. Entirely Teeny-approved! Well amigos, I must be leaving you now. I’m in the process of interviewing new musicians for my mariachi band and two of the young chaps have just arrived to sing-a-ma-jig. Who wants noodles when you can have tortillas! I find it very amusing sometimes when and where I can get the inspirations for my meals and recipes. 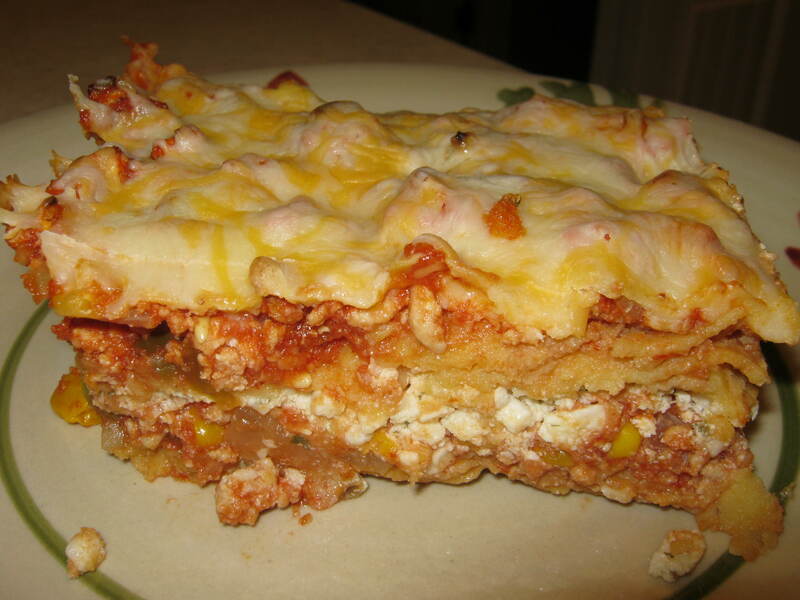 Just the other day, I was lounging on my feather bed, sipping my morning cappuccino bowl of distilled water and watching an episode of “Garfield and Friends” when the image of a large pan of lasagna popped onto the screen. I immediately thought, “hmm, now there’s something I don’t make very often… I wonder if I should make one for mi padres?” I mean, really. If a large cartoon cat appreciates a good pan (or twelve) of lasagna, why not a couple of large non-animated humans? The wheels in my head started turning and I quickly got out my mini dictaphone to take down the ingredients and cooking directions I would need to use for later. 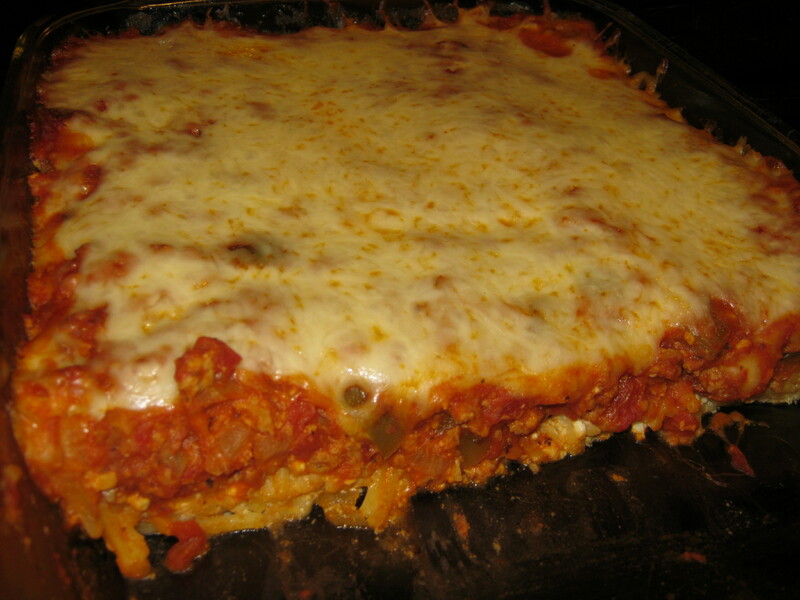 Now I know when most people hear the word “lasagna” they think of a cheesy, tomatoey meat-sauce sandwiched between layers of long thick pasta noodles served by a lovely Italian man named Giovanni. And if I wanted to be uncreative and boring, I would have made something exactly like that myself. But no, I am the TeenyLittleSuperChef. Therefore, I wanted to push the envelope, go against the norm, and of course, pay homage to my Mexican roots. So instead I came up with a muy bueno dish I like to refer to as, La Sagna: Mexican-Style. 2) Heat oil in a large skillet or pan over medium-high. Add onions, bell peppers, garlic and ground turkey. Cook until turkey is no longer pink and onions are softened. 3) Add tomato sauce, tomato paste, frozen corn, chili powder, ground oregano, salt and pepper. Turn heat to medium-low and allow to simmer about 8-10 minutes. 4) Meanwhile, combine cottage cheese, Parmesan and egg in a small bowl until well mixed. 5) Layer 6 tortillas evenly on the bottom of a 9×13″ casserole dish. They should overlap each other. Top with half of the meat mixture. Top that with all of the cottage cheese mixture. Layer with the remaining 6 tortillas and top with the rest of the meat mixture. 6) Bake 25-30 minutes or until hot and bubbly. Remove from oven and top with a nice layer of Cheddar cheese. Return to oven for 5 minutes. 7) Take out, let sit 5 minutes, cut into individual portions and dig in. Delicioso! I think even Garfield would approve of this one. Mi papa certainly did. I’m pretty sure there was some licking of his dinner plate at the end of the meal… and it wasn’t me this time… well, maybe a little bit. 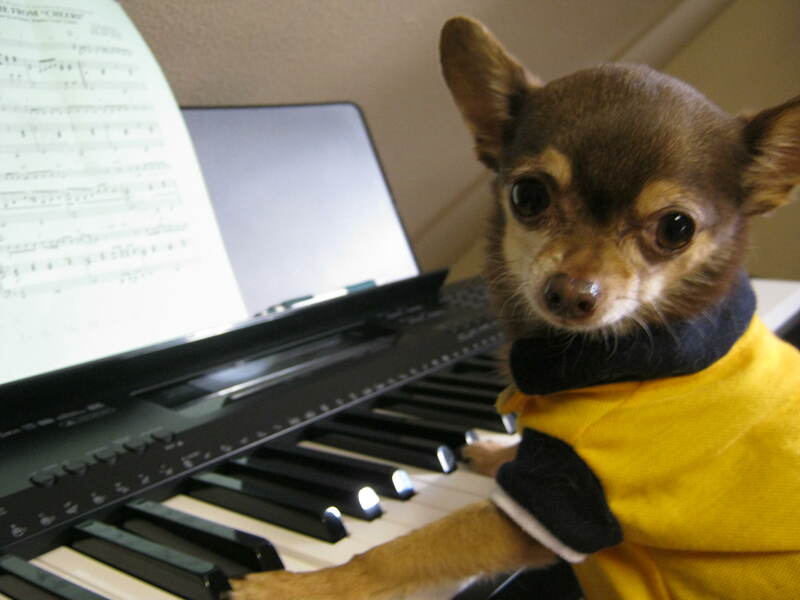 Beethoven, eat your heart out.